Unfortunately, while there may be some truth to this development at the national level, North Carolina conservatives seem not to have gotten the memo. As they have in so many other areas this year, state leaders are bucking the national trend and “doubling down” on their message of general hostility to immigrants—even those who have lived in the United States virtually all of their lives and who are, for all practical purposes, as “American” as anyone else. It’s almost as if the clock has been turned back to the early years of the last decade and state leaders are channeling hatemongering has-beens like Pat Buchanan and Lou Dobbs. Having come to full power late in the Tea Party wave, these people seem bent upon not missing out on their chance to flex some macho nativist muscle—whatever the long-term political cost to themselves and their movement or the impact on the human beings they’re targeting. 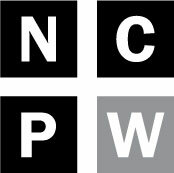 As numerous commentators including NC Policy Watch editorial cartoonist John Cole and Progressive Pulse contributor Andrea Verykoukis have noted, the move smacks of other infamous examples from history in which authoritarian regimes have attempted to brand groups of people with derogatory badges indicating lesser status. “Under the federal Deferred Action for Childhood Arrivals (DACA) program, more than 15,000 North Carolinians are newly eligible for driver’s licenses. The license designed for DACA drivers and approved by new Transportation Secretary Tony Tata includes a bold pink header and the words “LIMITED TERM” and “NO LAWFUL STATUS” in red. This is nonsensical. 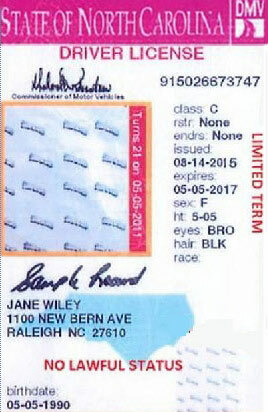 A driver’s license confers LEGAL STATUS to drive. How, if you have one, can you be accused of having no legal status? If you’re concerned about immigration status (and if you’re not the federal government, you probably shouldn’t be), you can ask for visas and passports and work permits and such. North Carolina has no need to issue such a discriminatory license to her drivers. New licenses issued to other non-citizens will also have the fuchsia front, though presumably DOT will be kind enough to leave off the bit about legal status. Greer, darling, you don’t need a driver’s license to vote in North Carolina. Why don’t you leave voter registration to the proper authorities? Lucky for us there’s a bill in the House that will prevent the DACA drivers from getting their licenses at all. Wait; is it really better for them to be unlicensed? I don’t get it. Failing that, however, the new design for non-citizens has our governor’s seal of approval partly because it will prevent the holders from voting. Didn’t I just go over this with Greer? Before even our greased lightning legislature can pass a voter ID bill, there are state authorities—including the second highest one!—using voter ID to discriminate against people. That’s beautiful, isn’t it? I thought color-coded oppression had come and gone, but signs that might be omens say we’re going to Maricopa and out of our minds. “There’s no apparent, specific law enforcement benefit to the new licenses. They appear instead to be a vindictive slap at immigrants who are allowed to be here, a middle school response to satisfy Republicans who didn’t want the licenses issued at all. Sadly, the driver’s license stripe is far from the only serving of anti-immigrant pink meat dished up by North Carolina conservatives of late. Two weeks ago, fifteen right-wing House members signed onto a bill that would halt the issuance of any licenses to the DACA immigrants in whatever form they might take. For these legislators, even pink stripes are apparently not enough of a derogatory brand. Meanwhile, just yesterday, one of the General Assembly’s most confused and troubled members revived his effort from 2011 to affirmatively close the doors of the state’s universities and community colleges. The bill would deny entrance to all “illegal aliens” – even those like the DACA young people who have lived here essentially all of their lives (and even those who somehow manage to pay out-of-state tuition). Good grief, even Rick Perry’s Texas allows such de facto Americans to attend college at in-state tuition rates. And while some may dismiss these efforts as the work products of back-benchers with little influence in the House leadership, it should be noted that it was just June when House Speaker Thom Tillis went so far as to have a friendly sit down with some representatives of the state’s true lunatic, anti-immigrant fringe. The Governor’s pink licenses only serve to reiterate the tacit blessing that Tillis issued at that time to such mean and nutty proposals. Let’s hope the Governor’s modern scarlet letter proposal implodes of its own lame-brained and mean-spirited weight. If it’s true, as some news reports indicate, that the Governor actually intends to brand not just the DACA kids, but all non-citizen immigrants with a special license, it’s hard to imagine that his buddies in the corporate board rooms will sit idly by as dozens of their executives who hail from overseas are subjected to the Hester Prynne treatment. Maybe, just maybe, the state’s conservative leaders will remember that it’s the corporate oligarchs who pay for their electoral victories and return to their tried and true political strategy of keeping the attack dog fringe on a short leash and largely out of sight. For now, however, it’s Pat McCrory who’s proudly taking this dangerous pet out for a walk around the block. It remains to be seen if he’ll be able hold onto the leash.